I have a sweet-tooth. I like all kind of desserts, western and Thai. Recently, I just found a store near my house selling my childhood Thai sweets called ฝอยทอง Foy Tong. I was so happy and have been going back to buy it almost every week (that means more exercise too!). Anyway, I was thinking about the word “ทอง /tong/” that many Thai desserts consist of the word ทอง ‘tong‘ which means gold and the Thais believe that gold, which symbolizes fame and wealth, will bring good luck to them. 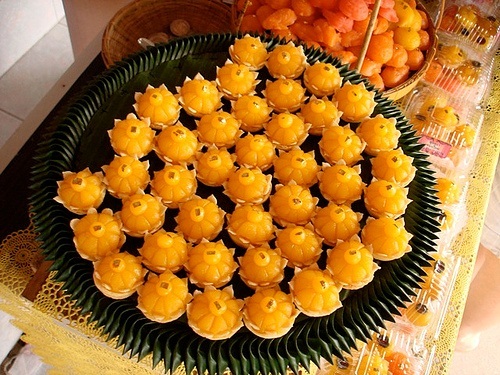 A friend of mine is getting married in two months so I will get to eat many Tong – Thai desserts because in Thai weddings there are nine auspicious Thai desserts included in Khan Maak ceremony. Let’s have a look what those Nine auspicious Thai desserts are. ทอง /tong/ means gold and หยิบ /yip/ to to pick something up. 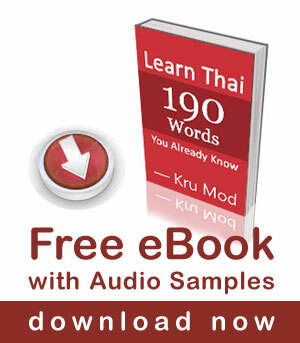 ทองหยิบ Tong Yip means whatever you touch or pick up, it is turned to wealth. It is made from egg yolk and flour then cooked in syrup (stew sugar in water scented with jasmine) each piece is made into the shape of a five-point star and place it in a china cup to allow it to firm up. Tong Yod means continuous wealth because it means the gold drop continuously equal to getting richer and sustain wealth. 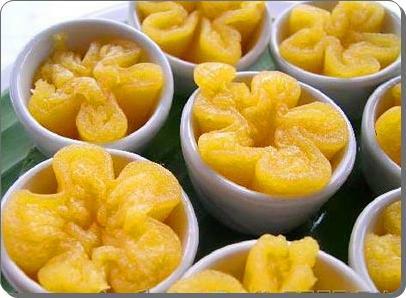 It is made from egg yolk and flour mixture and cooked in flower syrup just like “Tong Yip”. The drop shape is formed by dropping the thick mixture from the tip of a finger into hot bubbling heavy syrup. It tastes similar to “Tong Yip”. It means long lasting love and good fortune because of it is like golden noodles, which contains a positive meaning in long-lasting relationship. It is made from egg yolk pour through a narrow funnel which is placed over the pot of syrup so that the yolk will become golden threads in the syrup. Then use a long pointed piece of wood to stir the golden threads in the syrup until they become smooth. Then remove them from heat and wrap them around themselves so that they form the shape of a rectangle. This one is my favorite among the nine desserts. It means advancement in career and continual success. 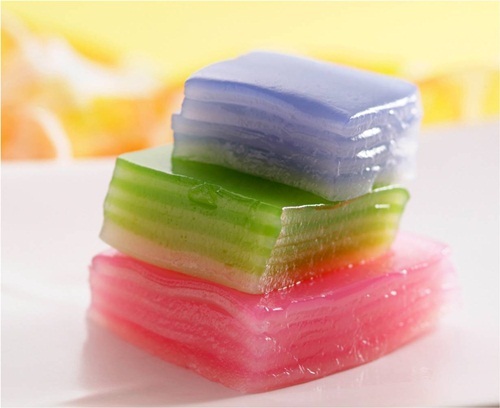 It is made of sugar, coconut milk, and flour mixed and set in cookie pan to harden into a jelly. 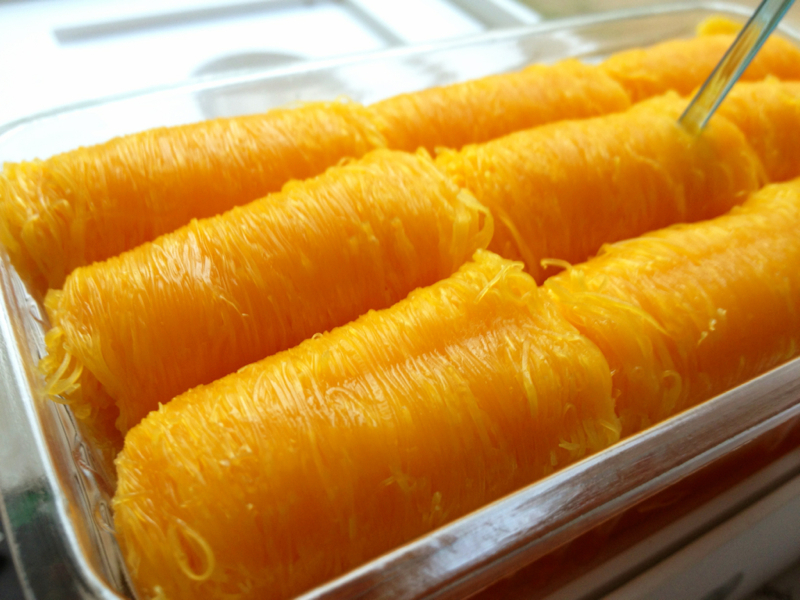 It is a very popular Thai dessert. I really liked this dessert when I was a kid. It means one with life or good one in life. It is meaningful for bride and groom because it means faithful. 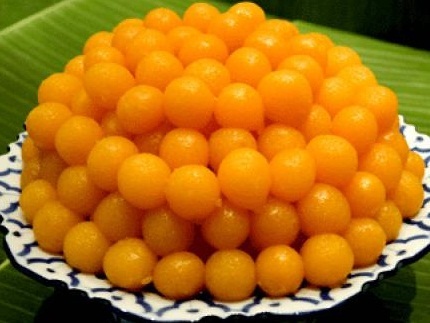 It is made of wheat flour, egg yolks and lots of sugar. The taste is little sweet and rich. It means you will get supported by the other people because the word “หนุน noon” in Thai means support to success. It is made from mashed steamed mung bean with coconut milk and stir it to thicken and made the shape into a ball, then dip into egg yolk and cook it in syrup. It means superiority like a King. 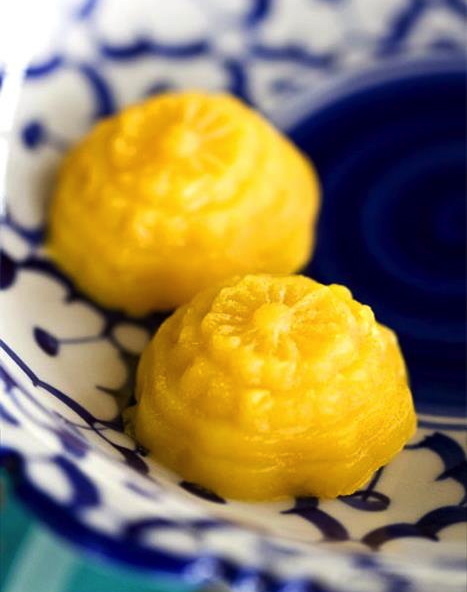 Mongkut means crown in Thai, so in the past this dessert served to the Royal family only. And even now Ja Mong Kut can be found rarely in the market due to its sophisticated production and difficult elaborate carving. The ingrdient of Jah Mong Gut is similar to Thong Ake, but the process is more complicated. The process of making Jah Mong Gut can take up to 7 hours! Jah Mong Gut is mostly used in job promotion celebration. Thai people believed that Jah Mong Gut has a shape similar to a crown, so it represent the high work position, the stability of the work, and the further promotion in the future. In Thai, Sanay สเน่ห์ /sa-nay/ means ‘charm’, and Chan จันทน์ /jan/ is short for Luk Chan which is g ‘nutmeg’, it also sounds the same as the word จันทร์ /jan/ meaning ‘the moon’. Ancient Thais believed that Sanae Chan represented the love life of the bride and groom as if it is as beautiful as a fullmoon that shine at night. It is often given at a wedding. Its ingredients are minced coconut mixed with flour, sugar, egg yolk, rice flour and adding Chan herb in it. The secret recipe is to mix the dessert with some flower juice so that it has a favorable scent. Fu ฟู /fuu/ means to rise or to increase, obviously implying prosperity. It can be given on any auspicious occasion. We Thai people usually offer all nine desserts in one tray so that the recipients get all the blessings at one time as well as enjoying the various kinds of desserts. Have you ever tried any of them? I would like to learn how to prepare the different types of “ice desserts” , one of them being the assorted beans in syrup. Thank you for visiting our website. I love Tong Yip and Tong Yod too! how to make jelly egg with yolk in the real shield . I am afraid I don’t know how to make such dessert. 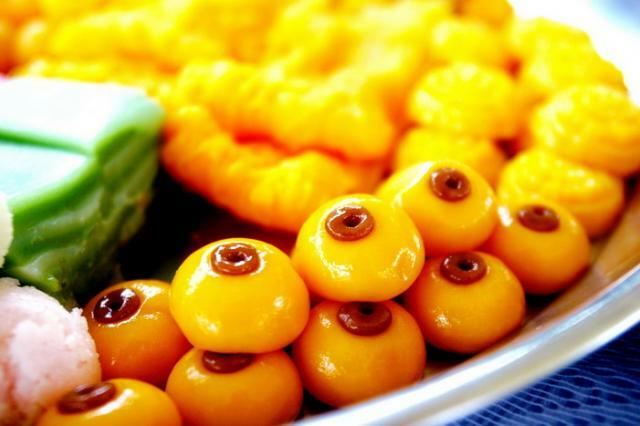 Are there any Thai desserts that have fruit dipped in chocolate or covered in it? Thanks for your help! Are there any Thai deserts that have fruit dipped in chocolate and then frozen? Are any combination of fruit and chocolate? Thanks for your blog! Hi rose, sorry for my late response. Chocolate is not a traditional Thai dessert so there are no Thai sweets contains chocolate. Some of it we have it in Singapore, I love to try thai traditional desserts, I heard some of them are wrapped in leaf, not sure where to find them? There are many street vendors selling Thai traditional desserts, you can also find them in big shopping malls like Paragon , Central World, Emporium. Sawatdee krap, they look and taste delicious. Lots of nam dtal or nam dtan. is there any places that i can go to try all these desserts in one time? 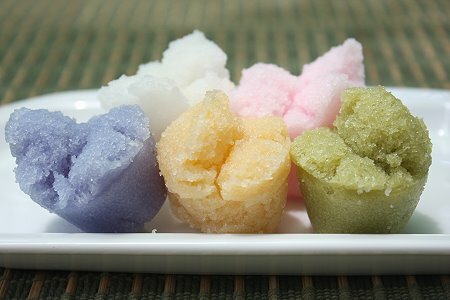 Those Thai desserts are beautiful to look at, but [for me] they taste too sweet. “Kanom Chan” isn’t too sweet, but I find the taste a bit bland, or not flavorful. My favorite typical Thai dessert is tapioca pudding.